I knew you would have a wonderful table for the Fourth of July, and boy you did a smashing job of creating this patriotic beauty. I do love the poppers too for the Fourth - they're part of the party celebration! I also love that you used the Statue of Liberty as your centerpiece, what greater symbol (other than our flag of course) of why we celebrate Independence Day. She looks right at home in a setting of burlap stars and stripes which are so appropriate for the citizens of this country, the ones that risked all to come to this country with little more than the cloths on their backs so they could have a chance to make a life of freedom for themselves and their families. God Bless America! Happy fourth of July!!!! Happy Birthday, America!!! You don't look a day over 39, baby. Love your festive Dress. Nothing is too much for you. 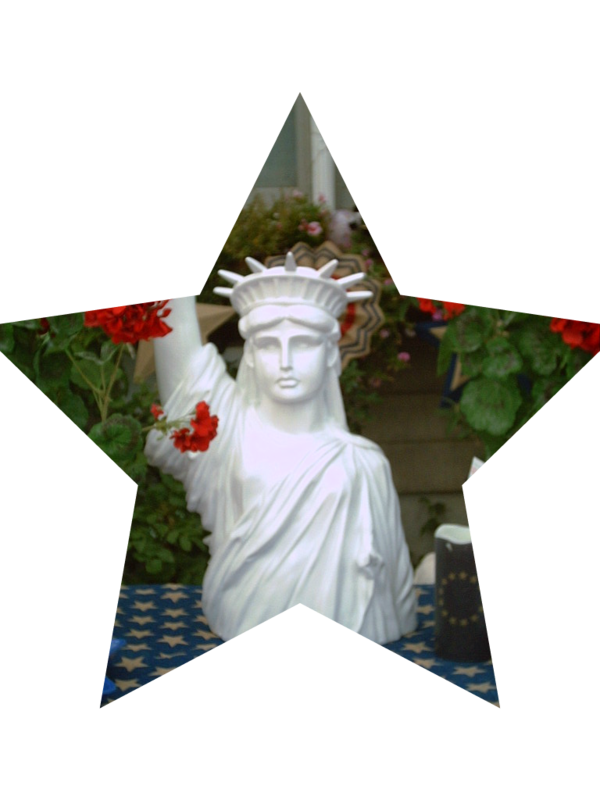 I love your Lady Liberty Valerie, how perfect for your patriotic 4th tablescape! I wanted to watch the AMC spy series and forgot to record it, I will have to check into that, it sounds fascinating! Wow what a wonderful happy bday America! Let the fireworks roll and the party begin! What a lovely table for the Fourth of July! I love your lady liberty! She makes such a great centerpiece, but all of the details are so pretty, the placemats, the napkins, etc. What are you serving your drinks in? Those clear balls look fun, I might like to try something like that sometime! I am pinning this and appreciate you coming to party with us at Celebrate Your Story! I'm Canadian but still love seeing what Americans do for their patriotic holidays and your Fourth of July tablescape is terrific! I really love the Statue of Liberty centerpiece with the geraniums beside it. Wow, 80 placemats! What a deal but you were smart to sell some - would be quite a party if you needed that many! What a steal on those placemats! I love your design style and anyone who thinks paper & plastic don't look classy on a tablescape has never seen yours! OMG, what an amazing table for the 4th., it is fabulous! 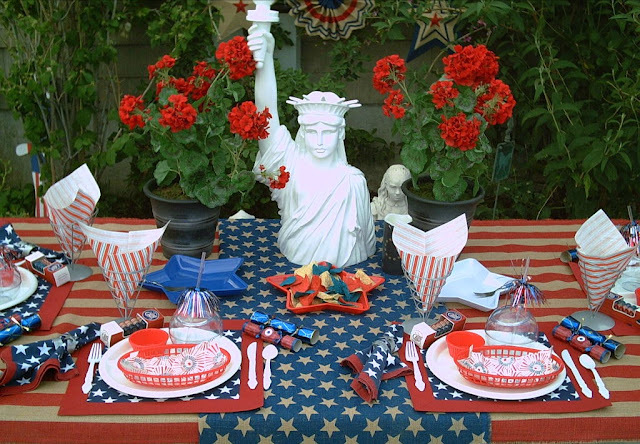 I love your patriotic linen and that Liberty lady centerpiece is just the perfect touch for anything patriotic. My goodness, 80 placemats?! I think I would make some money selling some too. So let the celeb roll! Enjoy your 4th. of July weekend my friend.